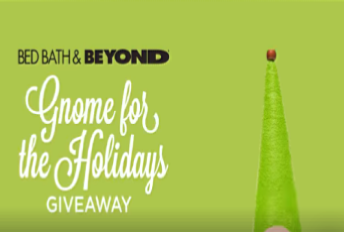 Bed Bath & Beyond Gnome for the Holidays Giveaway & IWG – Win a huge prize package worth $98,900! Win a 2019 Hyundai Santa Fe, a Tiny Heirloom 20′ Vantage Home, $2,500 in Bed Bath & Beyond gift cards and a Beaches Resort Vacation! ENTRY LIMIT – Each entrant may receive one (1) Sweepstakes entry and one (1) play per day during the Promotion Period. ELIGIBILITY – Gnome for the Holidays Giveaway is open only to legal residents of the fifty (50) United States (including District of Columbia) who are at least eighteen (18) years old or at least the age of majority in their state of residence or older at the time of entry. SWEEPSTAKES ENTRY PERIOD – The Promotion begins on November 14, 2018 at 9:00 a.m. Eastern Time (“ET”) and ends on December 13, 2018 at 11:59 p.m. ET. PRIZES – Sweepstakes Prize: ONE (1) GRAND PRIZE: Grand Prize package includes the following: One (1) all-new 2019 Hyundai SANTA FE Limited 2.4L 8-Speed Automatic Transmission: Valued at $35,405.00 (MSRP $34,300 USD and freight & handling $1,105.00 USD). America’s Test Kitchen $5,000 Baking Essentials Sweepstakes – Win a KitchenAid mixer and much more! Win a KitchenAid mixer and more! ENTER SWEEPSTAKES HERE – Organic Valley Sweepstakes page. ENTRY LIMIT – Entries are limited to 1 entry per individual during the entire Promotional Period. 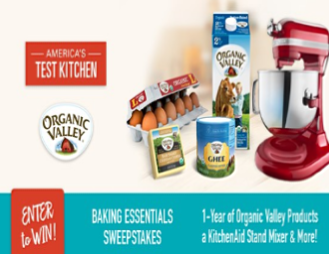 ELIGIBILITY – The America’s Test Kitchen $5,000 Baking Essentials Sweepstakes (the “Promotion”) is open to legal residents of the United States and the District of Columbia, 21 years of age and older at the time the promotion begins. SWEEPSTAKES ENTRY PERIOD – Promotion runs from September 4, 2018 (12:01 AM EST) to October 2, 2018. QVC & HSN—More to Love $100,000 Sweepstakes – Win $100,000! ENTRY LIMIT – LIMIT: One (1) entry per person per email address per 24 hour period. Once an eligible entry is made, IT WILL BE CARRIED forward to all remaining drawings (if any remain). ELIGIBILITY – This Sweepstakes is open to legal residents of the 50 United States and the District of Columbia who are eighteen (18) years of age or older at the time of entry. SWEEPSTAKES ENTRY PERIOD – The QVC & HSN—More to Love $100,000 Sweepstakes begins Saturday, February 10, 2018 at 12:00:01 a.m. (midnight) Eastern Time (“ET”) and ends Sunday, March 11, 2018 at 11:59:59 p.m. ET. 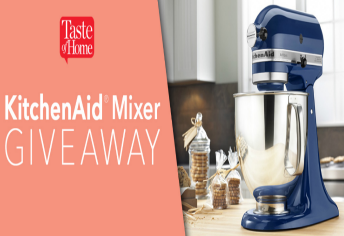 Taste of Home Stand Mixer Sweepstakes – Win a KitchenAid Mixer! Win a KitchenAid Artisan Mixer (5 winners)! ENTER SWEEPSTAKES HERE – Taste of Home Sweepstakes page. ENTRY LIMIT – Only one entry per person per day is permitted. ELIGIBILITY – The Sweepstakes is open to legal residents, age 18 and older, of the United States, its territories and possessions. SWEEPSTAKES ENTRY PERIOD – The Taste of Home Stand Mixer Sweepstakes begins October 1, 2017 and ends March 31, 2018. PRIZES – Five (5) winners will be selected. Each winner will receive a KitchenAid® Artisan® Series 5 Quart Tilt–Head Stand Mixer (KSM150PSER). Approximate retail value (ARV) is $429.99 each. Total ARV for all prizes is $2,149.95. 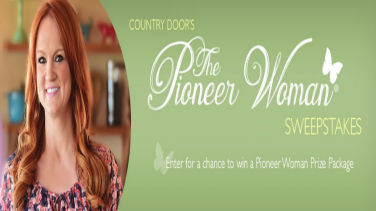 Country Door’s The Pioneer Woman Sweepstakes – Win a KitchenAid mixer & more! Win a KitchenAid Mixer & more! ENTER SWEEPSTAKES HERE – Country Door Sweepstakes page. By entering the sweepstakes, you are giving permission to Country Door to add you to their email list (you may unsubscribe at any time). ENTRY LIMIT – Only one (1) entry per person/e-mail address/authorized e-mail account holder/physical address/telephone number. ELIGIBILITY – You must be a legal U.S. resident 21 years of age or older physically residing in the 50 United States (includes DC) to enter or win. SWEEPSTAKES ENTRY PERIOD – Entries will be accepted starting Friday, October 14, 2016 at 9:00AM Central Time (“CT”) through Friday, November 11, 2016 at 11:59PM CT (the “Sweepstakes Period”). All entries must be received (online entries) or postmarked (mail-in entries) by 11:59 pm CT on November 11, 2016. Daisy Cottage Cheese Select a Label Sweepstakes – Win a KitchenAid Mixer & more! Win a year supply of Daisy Brand Cottage Cheese and a KitchenAid Ultra Power® Series 4.5-Quart Tilt-Head Stand Mixer! ENTER SWEEPSTAKES HERE – Daisy Cottage Cheese Facebook page. ENTRY LIMIT – Limit one (1) entry per person per email address. ELIGIBILITY – The Sweepstakes is open and offered only to legal residents within the United States and District of Columbia, who are eighteen (18) years of age or older (except residents of Colorado and North Dakota) at the time of entry. 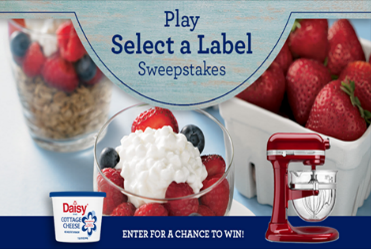 SWEEPSTAKES ENTRY PERIOD – The Daisy Cottage Cheese Select a Label Sweepstakes begins at 12:00:00 a.m. Mountain Time (MT) on June 1, 2016 and ends at 11:59:59 p.m. MT on June 30, 2016. PRIZES – Three (3) prizes will be awarded. The grand prize winner will be randomly selected and will receive a year supply of Daisy Brand Cottage Cheese and a KitchenAid Ultra Power® Series 4.5-Quart Tilt-Head Stand Mixer (total grand prize retail value of $593.47). The second and third-drawn random runner up prize winners will receive a year supply of Daisy Brand Cottage Cheese (retail value of each of $233.48). The total value of all prizes is $1,060.43. The year supply of Daisy Brand Cottage Cheese will be delivered to each winner in the form of 52 coupons each for a free Daisy Cottage Cheese. 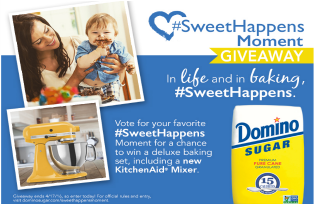 Domino® Sugar #SweetHappens Moment Giveaway – Win a KitchenAid Mixer & more! ENTER SWEEPSTAKES HERE – Domino Sugar Facebook page. ENTRY LIMIT – There is a maximum of one  entry per person regardless of entry method or platform used. ELIGIBILITY – To enter the Sweepstakes you must be (i) a legal resident of one of the 50 United States, and (ii) at least eighteen (18) years old at the time of entry. SWEEPSTAKES ENTRY PERIOD – The Sweepstakes begins at 12:00:01 a.m. Eastern Time (“ET”) on April 6, 2016 and ends at 11:59:59 p.m. ET on April 17, 2016. PRIZES – There will be one (1) Winner. The winner will receive: one (1) KitchenAid® Artisna 5-Quart Stand Mixer (ARV $349.99), one (1) KitchenAid® Flex Edge Beater attachment (ARV $29.99); one (1) USA Pan 5 piece bake set (ARV $49.99); one (1) Fiesta 17 piece measuring and baking set (ARV $59.99); one (1) Domino® Sugar oven mitt and spatula (ARV $10.00), and one (1) coupon redeemable for Domino® Sugar product (ARV $5.00). Approximate Retail Value of total Prize is $505.00. 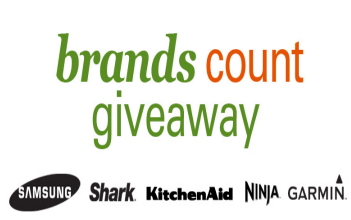 Shopko Brands Count Giveaway Sweepstakes – Win a 50″ Samsung Smart HDTV or other great prizes! Win a 50″ Samsung Smart HDTV or other great prizes (5 winners – a new prize each week)! ENTER SWEEPSTAKES HERE – Shopko Sweepstakes page. ELIGIBILITY – Contest open only to legal residents of the United States who are 18 years or older. 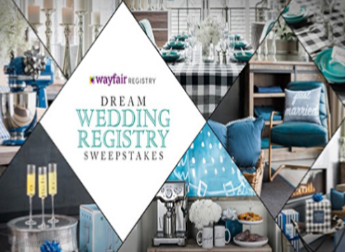 SWEEPSTAKES ENTRY PERIOD – Sweepstakes begins February 28, 2016 and ends April 1, 2016. PRIZES – Five (5) winners will be chosen- one winner per each week. The prize for Week 1 includes one (1) Samsung 50″ Smart HDTV Model UN50J5200. Retail value of $799.99. The prize for Week 2 includes one (1) Shark Navigator Lift Away Deluxe NV360. Retail value of $239.99. The prize for Week 3 includes one (1) KitchenAid Classic Plus 4.5-qt. Stand Mixer. Retail value of $249.99. 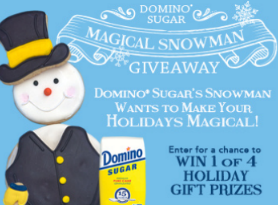 Domino® Sugar’s Magical Snowman Giveaway – Win 1 of 4 Holiday gift prizes! Win one of 4 great prizes (KitchenAid mixer, Flat Screen TV, personal laptop or an American Girl Doll Baking prize pack) – 4 winners! ENTRY LIMIT – Entries limited by Rafflecopter, some actions may be repeated daily (tweeting, etc). SWEEPSTAKES ENTRY PERIOD – The Sweepstakes begins at 12:00:01 a.m. Eastern Time (“ET”) on December 3, 2015 and ends at 11:59:59 p.m. ET on December 20, 2015. 5 Runner–Up Winners: Each of the five (5) runners-up will receive a Domino® Sugar prize basket (ARV $20.00).